Alpine Adventure is the leading cadet alpine skiing expedition, organised each year by Bristol & Gloucestershire Wing ATC. Fostering the spirit of adventure since 1998, the exercise has taught hundreds of air cadets from across the UK to ski in Bavaria. Whether you are a cadet, parent or a member of staff – we hope that you find this part of our website informative and inspiring. Ski clothing and equipment is expensive to buy. We advise against spending lots of money on ski specific gear but rather to beg, borrow or scrounge from friends, neighbours and relatives. Second-hand shops often have items of clothing for sale and sometimes supermarkets like Lidls and other stores sell items at really good prices. We recommend the ‘layer principle’ building from a base layer of thermal underwear that wicks perspiration away from the body, a shirt for warmth; a fleece sweater for warmth and an outer shell that is wind and waterproof. Goggles are a necessity as sunglasses are useless when snow is falling. See the cadet kit list below for what is required – note that there is little spare time so don’t bring lots of clothes. Storage capacity in the coach hold is limited and only 20 kg of baggage will be permitted on board. Exercise Alpine Adventure uses coach travel to make the best use of finance and time. A coach and two drivers stay with both parties to provide transport to the ski areas and evening activity venues. Exercise Alpine Adventure will be using Harding’s Coaches from Redditch – a company born out of Harding’s International that the exercise has used every year since 1998. On Friday evening the Bristol and Gloucestershire Wing coach picks up cadets at Gloucester and at Filton before heading for Dover. The South West Region coach picks up at key locations before meeting up with the Bristol and Gloucestershire Wing coach. After a short ferry crossing to Calais, the route takes in France, Belgium, Luxemburg and Germany. Coaches are equipped with toilet facilities but stops are normally taken every few hours to allow passengers to stretch their legs. With an on-board drinks machine and DVD entertainment, the 21 hour journey is far from arduous and travelling through the night allows plenty of quiet time to relax. Passing Stuttgart Airport marks the final stage of the journey and quite often gives the first hint of snow on the ground. A telephone call is made to the lodge to ensure that the resident chef has a welcoming hot meal ready as soon as the coach arrives which is normally around 1830 hours. The return journey starts early on the Saturday morning. Somehow this seems to be much faster – perhaps because everyone sleeps after an exhausting week’s skiing! The coaches usually cross on an early evening ferry from Dover and are back in the Region and Wing areas a few hours later. Times/locations of pick ups and drop offs are notified to participants in the immediate run-up to the exercise and confirmed with the drivers while we are in Bavaria. Normally our venue for the first few days of the exercise. It provides some of the best introductory slopes that enable beginners to improve their confidence and competence on skis. More experienced participants are able to take advantage of a wide variety of runs that span the mountain. We will normally visit Jungholz at some point during the week. It is situated in a small enclave of Austria and we literally cross an international border to ski there. Jungholz offers a number of runs of varying gradients that all end up at the one place. It is therefore a very convenient area to operate in. Jungholz also has a number of restaurants that many cadets and staff believe serve the best desserts in the Alps. A rural venue providing a variety of different ski runs. Access has been greatly improved thanks to the introduction of a new gondola. In 2010 a brand new restaurant opened high up on the slopes enabling ‘pit stops’ to be taken without having to descend to the base area. Sometimes used on our final day. Hundle has two base stations and gives cadets the challenge of skiing across a mountain. With a summit at 2232 metres, Ifen is our highest ski area and the environment is akin to the high Alps in Austria and France. There is normally excellent snow on the upper slopes and the runs to the base are spectacular for all grades of skier. Exercise Alpine Adventure utilises a variety of the ski areas in the Allgau typically visiting about four different areas during the week to provide cadets with experience of a range of slopes. Here is some information about the ski areas and links to their websites for more details. Use their webcams to check out the latest snow conditions. Skiing is a physically demanding activity. Eating well is vital to maintaining stamina. Our food is simple but hearty fare. We can cater for special diets if we are notified in advance. At Vorderburg the catering is provided by our resident chef who has been with Alpine Adventure from the start. He updates the menu each year to ensure that it is popular with cadets. Breakfast at 0730 hrs consists of a buffet comprising cereals, bread rolls, cheeses and meats. Cadets and staff are responsible for making up their packed lunch from the excellent buffet. Our evening meal is normally at 1800 hrs and consists of two courses with choices. Cans and confectionery can be purchased from a canteen carried on our coach during ski days and from the lodge during the evenings. Cadets are divided into ‘duty groups’ who are responsible for helping to clear away and wash up after a meal. These are simple tasks that with some organisation do not take long to complete. After the energetic Games Night, we always refuel with pancakes cooked by our own Celebrity Chef assisted by his latest apprentice. The Bristol and Gloucestershire Wing group stays at the Voderburger Hutte (Telephone 0049-8327-7763 incoming calls only) situated in the small village of Vorderburg. Travelling time by coach to the ski areas is normally 30-40 minutes. The accommodation is simple but adequate. Cadets are accommodated in multi-occupancy rooms on the first and second floor of the building. Some staff stay in rooms on the cadet floors to provide supervisory cover. Others live next door above the restaurant where the party takes meals. There are a number of communal areas where cadets can relax and table tennis is available for energetic individuals. All meals, except lunch, are eaten in the lodge restaurant. An ex-British Army chef (who has been with us since 1998) cooks our meals and acts as the local agent for Exercise Alpine Adventure. Exercise Alpine Adventure is about skiing. Cadets spend more time on the slopes than on most school ski holidays so a very high level of fitness is required for a very full week of physical activity. We tend to follow the below daily and weekly templates that are adjusted if necessary e.g. because of changes to weather conditions. Collect skis and boots from hire shops at Wertach (Vorderburg group) and Sonthofen (Muhle group) – with luck skiing at Oberjoch by 1100 hrs. Qualified ATC staff provide instruction and leadership on the slopes. Their National Governing Body (NGB) qualifications include those issued by BASI, CSIA, PSIA and Snowsport Scotland. Several of our qualified staff learned to ski on the first expeditions in Scotland or on later ones in Germany. Most have never missed a year since and know our ski areas really well. Their personal commitment to Alpine Adventure is exemplified by the fact that they have paid out significant sums of their own money to obtain and then maintain their skiing qualifications. Our ski leaders travel out in advance of the main party and spend at least a day undergoing refresher training before skiing with cadets. Other ATC staff provide back-up to the ski leaders on the slopes and help to run the evening activity programme. Every day a designated member of staff provides safety cover. They have access to a hire car and, if required, take any casualty to hospital for a medical check up. We are always keen to attract new members of adult staff. You don’t have to be an expert skier – you can join in with the cadet groups to learn. All we require is a willingness to help, bags of energy and above all a massive sense of humour! Anyone with these essential qualifications should contact Bristol and Gloucestershire Wing Headquarters (Tel 01452 722931). In 1998 Exercise Alpine Adventure moved back to its original home in Bavaria. Initially Alpine Adventure was based at Gschwend beside the Rottachsee. This centre held about 36 personnel and proved to be an ideal base. Unfortunately, because of restrictions on space, some adults had to be accommodated in the village of Petersthal – a 2 km walk that seemed to get longer every night! The exercise proved to be very popular from the very first year as can be seen in the 1998 group photograph. As a result, in 1999 and 2000 the exercise was spread over two weeks to take advantage of different half terms and enable more cadets to take part. Sparked by an urgent need to find alternative accommodation, Alpine Adventure moved in 2001 to Haus Schanz near Kempten. The Schanz had more bedrooms and enabled Alpine Adventure to grow in size. A number of holiday flats were rented around the Schanz and this made it possible for up 70 people to take part. 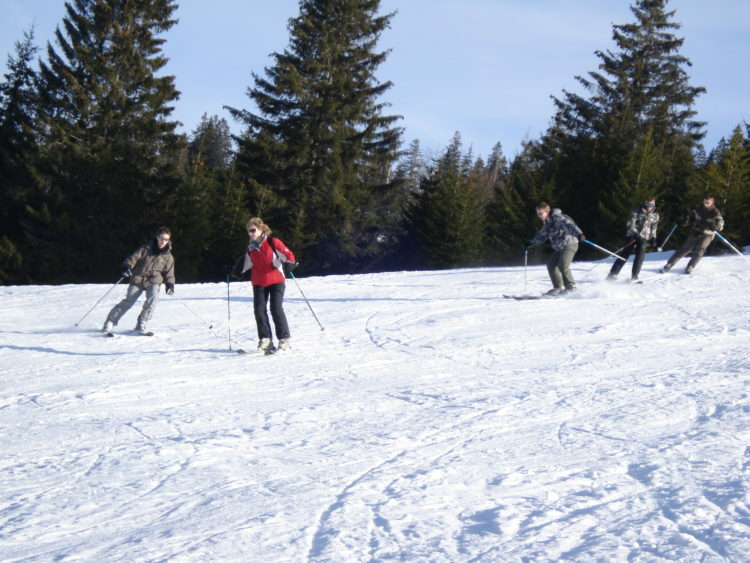 Exercise Alpine Adventure originally began life in Bavaria in 1991 when a group of cadets from 125 (Cheltenham) Squadron were taught to ski by British Army instructors. It was very late in the season and only a limited area on the Kanzelwand (1957 metres) above Kleinwalsertal was open. Nevertheless the cadets had great fun and the idea was born. The picture shows a 1991 group setting off from a mountain cafe after lunch. There was then a gap of a few years until 1996 when the next ski exercise was staged in Scotland. Snow conditions on Cairngorm were excellent and the cadets enjoyed a great week staying in accommodation managed by RAF Kinloss. The exercise was repeated again the following year. Unfortunately there was not so much snow and skiing was limited to the Lecht ski area. The cadets had a fantastic time but a decision was taken to explore the possibility of moving the exercise back to Europe. More and more adult staff qualified as Alpine Ski Leaders making it possible to expand Alpine Adventure. Since 2005 cadets from across the South West Region have taken part – almost doubling the numbers. Initially, the Region party was accommodated at Haus am Brunnenbach near Sonthofen, the venue for the very first skiing exercise in 1991. In 2010 the Region changed its base to Wertach. Over the years cadets from other Wings as far afield as Aberdeen have also participated on Alpine Adventure and there is potential for more. Our target is to achieve over 100 cadets! In 2008 the Bristol and Gloucestershire Wing moved to a new accommodation base in the village of Voderburg (861 metres) – not too far from Gschwend. This base is now central to the ski areas and reduces the daily travelling time. It also allows all of the party to be accommodated in one building. The Alpine Adventure package of accommodation, travel, ski hire and instruction cannot be beaten by schools and other youth organisations. Places are always over-subscribed and the expedition, therefore, gives priority to cadets who have never skied before. Exercise Alpine Adventure is now one of the ATC’s top adventure training expeditions. Considerable experience has been developed over the years but there is no room for complacency and the consistent aim is to make Exercise Alpine Adventure better every year. This was the case in April 2007 when a pilot Exercise High Alpine Adventure was successfully staged in France. The participants took full advantage of the Espace Killy – one of the world’s biggest and best ski areas. Participants were able to soak up a spectacular view of the very famous resort of Val d’Isere.